Health-conscious people are turning to Full-Spectrum Infrared Saunas. An exciting discovery was made over thirty years ago, when researchers showed the enhanced healing effect that red and near infrared light (600-1000nm) has on the human body. Today, there are two main bands of infrared light: high energy Near Infrared which provides healing light therapy, and Thermal Infrared (starts in the middle of the Near Infrared Band at 1150nm and greater, includes near, mid and far infrared), which provides heating (the sauna effect) and detoxification. 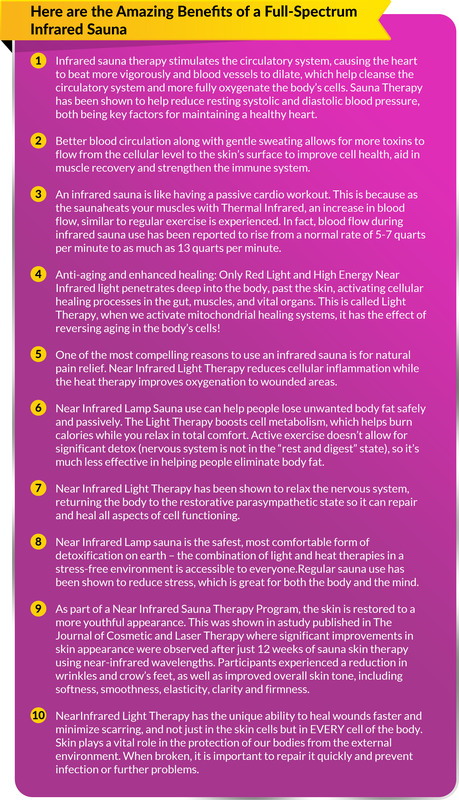 Each is beneficial in its own way, but it’s undoubtedly the most beneficial to have both – enter the incandescent, full-spectrum infrared sauna, which delivers the best of both worlds in natural healing! What Makes a GREAT Infrared Sauna? Light Source Natural Light: Uses full-spectrum incandescent bulbs, which deliver the full light therapy band and the full thermal (heat) therapy band in the natural form we’ve evolved to receive. Use far-infrared ceramic emitters or carbon emitters which only deliver the less penetrating, lower energy far infrared wavelengths. Some have artificial LEDs to provide light therapy, but these are isolated to a few select wavelengths, produce irritating flickering effect, and dim very rapidly from thermal stress. Setup Simple: Doesn’t require any tools to set up and takes about 10 to 20 minutes. Require specialized assembly that takes hours to set up and disassemble. Accomodations Accommodating: Wheelchair accessible and suitable for all ages and body types. Not wheelchair accessible. EMF Toxicity Smart design: E-shielded power cord, e-shielded wiring, e-shielded light guards, resulting in ZERO effective EMF, both magnetic and electric fields (0 mG and 0 V/m) where the user sits. FIR ceramic emitters and black carbon panels are extremely high EMF, both their magnetic fields typically 30-50mG and their electric fields in 200-1000 V/m, right where the user sits. Material Offgassing Toxicity Smart design: The sauna is built from carefully chosen natural, unadulterated hypoallergenic materials from the wood to the canvas. Often use cheap materials that are chemically-treated and potentially harmful when heated due to offgassing of formaldehyde, urea and other chemical toxins.